What an adorable little read this is to share with baby! Studies have shown that the more we read to and talk to our little ones, the better their verbal understanding and larger their vocabulary will be. As pretty much every Christian knows, scripture says “If you lead a child on the path which he should go, when he is old he will not stray from it” Proverbs 22:6. That being said, my favorite line in the whole book is at the end when a mirror reflects baby’s precious face and you read, ‘Who does God love? God loves _____’. The space is there so that you can write baby’s name in, of course, but I think I’ll leave it blank so that one day we can pass it on. It also shares a scripture at the very end of the book, one that we would all be good to remember! I love that it’s there at the end of the book so that we can add that into our teaching the little ones and even get a new scripture memorized for ourselves! Babies enjoy books, looking at other babies, and their own flowering abilities. This short rhyming poem combines all three in a sweet and happy way, while introducing babies to God’s love for them. The simple words are paired with colorful images of babies engaging in familiar activities, allowing the book to be used as an introductory concept book as well. And it ends with a reminder that Baby is always loved by God. 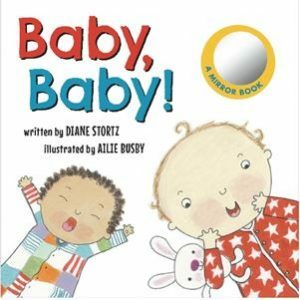 Diane Stortz is an author, editor, mother, and grandmother. Her professional achievements include creating Sunday school curriculum and working as an acquiring editor and editorial director at Standard Publishing. Diane has published more than a dozen books, including two titles for women, but her heart belongs to children’s books. Diane says that more than anything else, she hopes to make God’s wonders known to the next generation.